Trip is based one one full A-Star Helicopter. IF there is a large enough Wait List then we will look at booking two flights totalling ten people. If there is fewer than 10 people registered I will offer doing another flight which will be a higher cost. Day 1: Fly from Squamish Airport to Jim Haberl Hut. Setup inside the hut. We will then ski tour up a short ways to do some snowpack testing to ensure stable and safe skiing. After this we will have a short lunch then ski up to do a moderate run. Day 2: Potential Objectives could be Alpha Serratus Col, or the Serratus North face. We will be cooking dinners as a group and part of your registration will include food for group meals. You will be expected to assist with either cooking or cleaning for both evenings. Please let me know if you have dietary restrictions or preferences. Recommended expert level skier only, this trip is designed for advanced to expert skiers who are NO FALL skiers on double black diamond terrain. The Tantalus range features very steep big mountain skiing where consequences of a fall is almost assured injury. 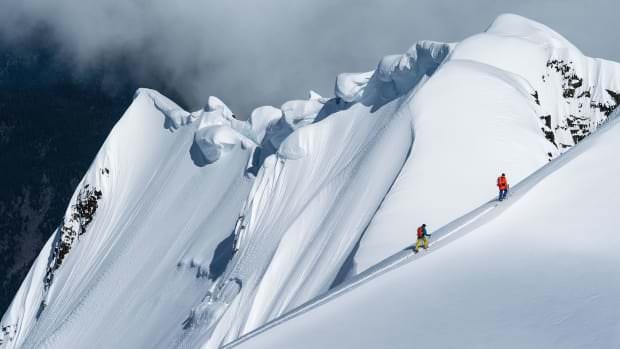 All participants must have mountaineering experience, to access some of these ski descents bootpacking steep terrain will be required. Late March is typically fine for weather but please keep yourself open to the possibility that we may not be able to fly out on Sunday should the weather not cooperate.